Add value to your home with the versatile and easy-to-maintain flooring you are sure to enjoy for years to come. Fashionable and practical for any home due to its natural look, tile flooring offers beautiful designs and durable materials. Make your kitchen look like a classic checkerboard for a timeless, retro appearance or add a border around your bathroom for a simple yet elegant design. With the creative design options, long-wearing durability, resistance to water, and easy maintenance, tile floors made of ceramic are excellent choices when remodeling your home. If you have an active household full of pets and children, pick ceramic for your new flooring. Designed for high-traffic rooms, this heavy-duty flooring is both impact and scratch resistant. Easy to Maintain: With regular cleaning, ceramic is guaranteed to last for generations. Versatile Design: With various styles and options to choose from, your home looks appealing with consistent floors throughout. Budget-Friendly: You get the look you want without the high-end price, while saving money on repairs and adding cost-effective value to your home. Durable: Perfect for high-traffic living areas, ceramic is resistant to impact, water, and everyday wear from active households. Stylish: Pick the finish, colors, and style to match your home’s furniture and existing decorative features. Choose from an almost limitless amount of colors, sizes, shapes, and finishes for your brand-new ceramic flooring. There are plenty of ways to create the perfect design that matches the existing theme of your home’s décor. From glazed and unglazed finishes to deco, rustic, or contemporary styles, ceramic floor tiles come in several different shades and texture variations. Look for the Quick-Pick icons on all of our flooring options to see their performance in a variety of conditions and applications. This is to help you decide which tile flooring is best for your home, budget, and needs. These icons also show you the grade of the tile, from low to medium to high, to help you choose the variation that is best suited to your decorating goals and comfort level. A sturdier variety of ceramic tile, porcelain tile is a type of ceramic created by firing denser, finer clay at higher temperatures than standard ceramic. It has many of the same properties as ceramic, but the manufacturing process makes these tiles even stronger and more resistant to water absorption. Different colors and styles can be combined to create beautiful patterns on your floor. Because it's able to resist scratches, spills, and heavy foot traffic, porcelain tile is ideal for bathrooms and kitchens. Place it anywhere you suspect moisture may be an issue. Once it is sealed, porcelain is virtually waterproof, stopping the growth of dangerous mold and bacteria. Why Choose Slate Tile Floors? Make a statement with slate. A slate tile floor is a luxurious type of flooring option we offer at our flooring showroom. A popular choice in many homes and businesses because of its natural beauty, slate tile creates the impression you want. This fine-grained natural stone comes in different shades of greens, blacks, and grays, and each tile has unique vein patterns that make your floors truly one-of-a-kind. When you think of slate, roofing may come to mind. However, slate tile makes for beautiful flooring. Sleek, smooth, and stunning, slate is a unique choice for any home. Add slate tile to your bathroom, kitchen, or any other room in your home. If you want to maximize the longevity of your new tile floors, allow our experts to handle the tile flooring installation. Before beginning a project, we first measure the rooms where the new flooring will go. This measuring service is completely free, and after we finish, we provide you with a free estimate on the total cost of materials and labor. Our trained flooring professionals have years of experience at installing all varieties of tile flooring. They know how to give customers the smooth, seamless results they desire. We only use the highest quality tools and materials for each flooring installation so the bond to the subflooring stays strong, and the tiling will not shift over time. 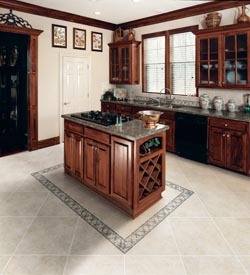 Contact us for a design consultation when you are considering a ceramic tile floor in your home. We serve the communities of Turlock, Ceres, Hughson, Modesto, and Newman, California.